This type of mochi rice cake is eaten to celebrate the New Year. The rice cake is wrapped around miso paste and burdock root simmered in syrup. 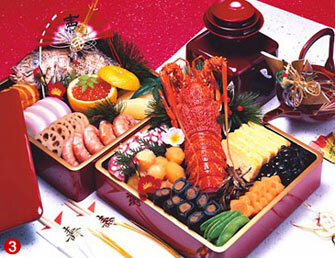 The recipe was originally for cakes used in New Year rituals at the Imperial Court. 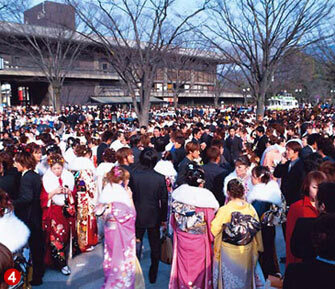 The grounds of the Imperial Palace in Tokyo are usually closed to the general public, but on January 2 everyone can enter to offer their New Year's wishes to members of the Imperial Family, who wave to the crowd from a palace balcony facing the East Garden. 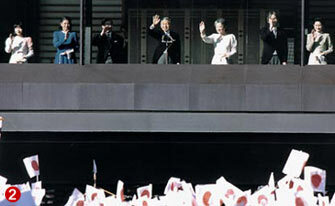 It was only after World War II that all citizens were given the right to visit the palace grounds for this purpose. Japanese amateur and professional soccer teams compete in the Emperor's Cup, a prestigious tournament with roots going back 80 years. The act of writing with a calligraphy brush for the first time in the new year. Auspicious phrases and expressions are written, and a wish is made that one's calligraphy will improve. Following an old Chinese custom, five of the old sekku (special days of observance) are still celebrated, on January 7, March 3, May 5, July 7 and September 9. On the first of these days, jinjitsu, seven herbs, including seri (Japanese parsley), nazuna (shepherd's purse), and gogyo (marsh cudweed), are simmered in a rice gruel, which is offered to the gods and later eaten by members of the family. Large round kagami mochi rice cakes are traditionally offered to the gods during the New Year festivities, and on this day the mochi cakes are cut into small pieces and eaten in o-zoni (vegetable soup) or o-shiruko (adzuki bean soup). Once they are cut up, New Year's is considered to be over. New Year's decorations, such as kado-matsu (decorative arrangements of vegetation) and shime-kazari (straw cord ornaments), are taken to a neighborhood shrine or other place and burned. Warming up beside the flames is supposed to bring one good health and happiness for the whole year. This ritual is performed throughout the country. 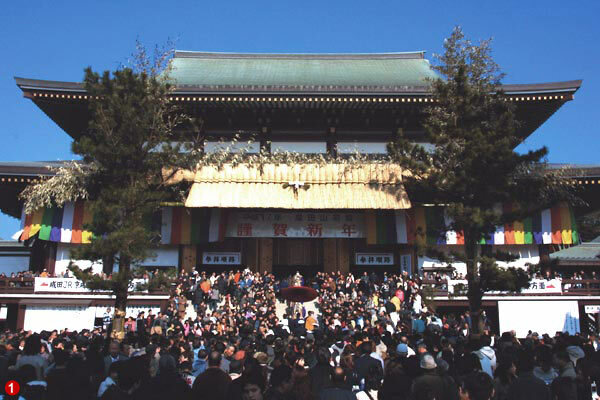 The event at Torigoe Shrine in Tokyo is especially well known. Supposedly the coldest time of the year.